August 9 is the 221st day of the year(222nd in leap years) in the Gregorian calendar.There are 144 days remaining until the end of the year. 1854 – Henry David Thoreau publishes Walden . 1930 – Betty Boop makes her cartoon debut in Dizzy Dishes . 1945 – World War II: Nagasaki is devastated when an atomic bomb, Fat Man , is dropped by the United States B-29 Bockscar . Thirty-five thousand people are killed outright, including 23,200-28,200 Japanese war workers, 2,000 Korean forced workers, and 150 Japanese soldiers. Year 48 BC was a year of the pre-Julian Roman calendar. At the time, it was known as the Year of the Consulship of Caesar and Vatia. The denomination 48 BC for this year has been used since the early medieval period, when the Anno Domini calendar era became the prevalent method in Europe for naming years.48 BC for this year has been used since the early medieval period, when the Anno Domini calendar era became the prevalent method in Europe for naming years. The Great Roman Civil War, also known as Caesar's Civil War, was one of the last politico-military conflicts in the Roman Republic before the establishment of the Roman Empire. It began as a series of political and military confrontations, between Julius Caesar, his political supporters, and his legions, against the Optimates, the politically conservative and socially traditionalist faction of the Roman Senate, who were supported by Pompey and his legions. Arnold Fitz Thedmar was a London chronicler and merchant; he was born in London. Year 1537 (MDXXXVII) was a common year starting on Monday of the Julian calendar. Year 378 (CCCLXXVIII) was a common year starting on Monday of the Julian calendar. At the time, it was known as the Year of the Consulship of Valens and Augustus. The denomination 378 for this year has been used since the early medieval period, when the Anno Domini calendar era became the prevalent method in Europe for naming years. Traianus was a Roman general under Emperor Valens with whom he died in the battle of Adrianople. 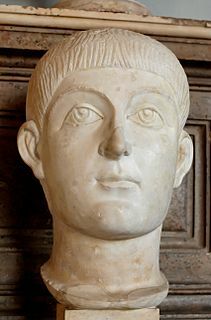 Valens was Eastern Roman Emperor from 364 to 378. He was given the eastern half of the empire by his brother Valentinian I after the latter's accession to the throne. Valens was defeated and killed in the Battle of Adrianople, which marked the beginning of the collapse of the Western Roman Empire. Edith Stein, was a German Jewish philosopher who converted to Roman Catholicism and became a Discalced Carmelite nun. She is canonized as a martyr and saint of the Catholic Church, and she is one of six co-patron saints of Europe. Saints Firmus and Rusticus are venerated as two martyrs of Verona. Their unreliable Acts state that Firmus and Rusticus, kinsmen, were prominent citizens of Bergamo. They were martyred at Verona under the Emperor Maximian after refusing to sacrifice to pagan idols. Under the judge Anolinus, they were tortured, beaten with clubs, and beheaded. Saint Herman of Alaska was a Russian Orthodox monk and missionary to Alaska, which was then part of Russian America. His gentle approach and ascetic life earned him the love and respect of both the native Alaskans and the Russian colonists. He is considered by many Orthodox Christians as the patron saint of North America. Saint Cándida María de Jesús - born Juana Josefa Cipitria y Barriola - was a Spanish professed religious and the founder of the Daughters of Jesus. The order - founded in 1871 - was under Jesuit direction from her spiritual director and was involved with the education of children in Salamanca though expanded during her lifetime. March 11 is the 70th day of the year in the Gregorian calendar. There are 295 days remaining until the end of the year. Wikimedia Commons has media related to August 9 .